You surely know how essential it is to audit your site in order to secure your SEO link building activities. 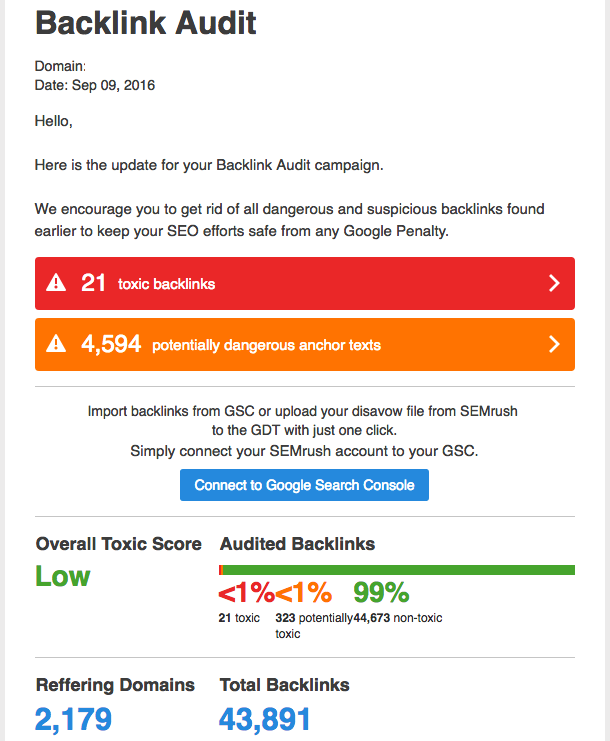 Our Backlink Audit tool is here to help you with that. Recently, we have embedded the periodic recrawl feature, which is available for our paid subscribers. Previously, you could re-audit your site by pressing the ‘Re-run campaign’ button only. But there’s no need to do this manually any longer! Now you can set up a periodic recrawl, so your site will be checked automatically. The ‘Recrawl schedule’ menu is located in your campaign’s settings. You can schedule a site check-up once a week, once every two weeks, once a month, or disable the feature by selecting ‘never.’ All paid users’ campaigns will be recrawled once every two weeks by default. Now you can take full control of your link-building process. If after the audit something changes in your backlinks analysis results, you’ll see these changes reflected in the ‘Overview’ and ‘Lost & Found’ tabs’ data. Moreover, after the recrawl you will receive an email with information regarding the recrawl’s results. See the email example below. Still don’t have the tool set up? You can do it in no time. Go to SEMrush Projects. If you already have at least one active project running, you'll notice the ‘Backlink Audit’ section among the proposed tools. Click the 'Set up' button and follow the wizard’s instructions. You can find more details in this manual. As always, we’re waiting for your feedback, which is extremely valuable to us. Send your ideas and suggestions to [email protected]. Start working with the tool right now!